l am doing a community service this year for part of my Bar Mitzvah. Community service is a mitzvah or good deed. Community services are important to me because they help people who need it and make me feel good about myself. Community services can be hard too because they require time and energy and also might cause you to step out of your comfort zone. 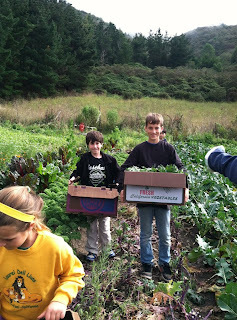 Last week l did some gleaning at green gulch. The food we collected was donated to Saint Vincent De Paul. I had a good time picking food with my friends and felt good about all the food we were donating. In the future I will do more community services such as volunteering at soup kitchens or a animal shelter. Well done Eli. Thanks for helping out and in our neighborhood as well. Jalapeno's manure helped grow those plants. And what good modeling for your friends. Dr. V says,"As we grow in spiritual consciousness we identify with all there is in the world. Then there can be no exploitation. It is ourselves we are helping. It is ourselves we are healing." Thanks for all the blogging it is so nice to be connected with you all in this way. I don't feel so far away knowing what you are doing and how you are being. What are you reading now and what are you learing now?